Large rustic home with unique upgrades throughout. One of our Signature Series homes, Sun-Up Bay is an absolutely gorgeous lodge style waterfront property that features spectacular upgrades throughout. It has a luxurious, yet simultaneously sturdy feel—making it perfect for children and adults alike. From the unique stonework to the high quality wood touches everywhere you look, it embodies artisan North Idaho craftsmanship. 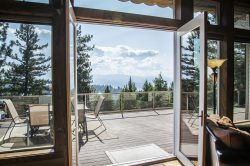 The location is spectacular with wonderful open views of Lake Coeur d’Alene from a sheltered deep water cove along the Western shore. With garage parking and a front door without steps, it’s also easy for everyone to access. The welcoming entryway of the home leads into the great room. You’ll immediately notice the lake views of Windy Bay out the log-trimmed windows and the floor to ceiling stone gas fireplace. On the far side of the great room is the spectacular kitchen—beautifully upgraded with stainless appliances and a copper sink. The unique bar has a wooden countertop, stonework down the front, and seating for 4 in the rustic wooden swivel stools. With a double oven and ample counter space preparing meals will be stress-free. If you’d like to enjoy the outdoors while you cook, you can step onto the covered deck that features an outdoor kitchen and patio set. What could be better than a dining on the deck with breathtaking views? For indoor options, you’ll find a wooden table with seating for 6 and lake views adjacent to the kitchen bar. The sleeping accommodations are just as lovely as the rest of the home. Head up the log staircase to a spacious loft and you’ll discover the master bedroom with a great log bed. It features an attached bathroom with handcrafted countertops, a spacious shower, and a soaking tub that will be the perfect relaxing oasis after a day of playing on the water. There are also 4 additional fantastic bedrooms and 2 more luxurious bathrooms. One bedroom that includes an attached bathroom with a gorgeous stone shower can be found on the main floor. The other 3 bedrooms and another bathroom with a shower/tub combo are located downstairs. This lower level of the home also features a second living room area with a TV, comfy seating, and access to another covered deck. Of course you’ll want to spend a lot of time outdoors and Sun-Up Bay Lodge has plenty of areas to do so! You’ll enjoy a private sandy beach and a double dock that can accommodate 2-3 boats up to 25 feet each. Last, but certainly not least, this home has decks for days. In addition to the two large covered decks, the staircase to the water offers a small patio with seating nestled just above the beach area—perfect for relaxing while still having a clear view of the kids playing. This beautiful home and its picturesque Northwest views will set the perfect tone for your relaxing retreat. Service and responses were very strong, I called to see about cleaning off the deck and they sent someone right away. ALL team members were great! Very easy and simple to follow the procedures. All members of your team made themselves accessible for any needs we might have. Very accommodating. I know someone who recently visited, and he encouraged me to go there for a get-away and check it out. We loved the woodsy feel and the neighborhood. We were surrounded by beauty, and enjoyed relaxing and calling the rental place "home". Deer came right down the driveway, mother and baby. Everything was so enjoyable. We loved the home-plenty of room in a beautiful setting.